Team Parker with Maximum Motorsport’s Stephen Jelley heads to Thruxton looking to push on from a solid start and into ‘more representative’ territory for what both team and driver feel is capable machinery. 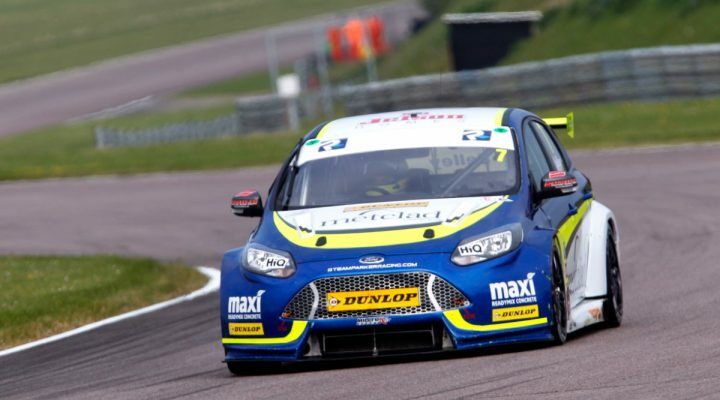 The BTCC returnee has completed each of the six rounds so far and believes now is the time to place his Ford Focus in and around the points-paying positions. “I’ve finished all of the races so far this season,” said Jelley. “We’ve been fired off a couple of times and we had a puncture at Brands as well as some issues with the car where we’ve just about managed to drag it home. “If I’m honest, I am a bit disappointed in our qualifying positions so far and in our performance and I’m sure we can do better. “We showed a bit more of an indicative pace at Season Launch, around the edge of the points-paying spots and I think we should be shooting for anything around there. “With the car the way it currently is, it’d be very hard to qualify in the top 10 but we should be well inside the top 20. “Our Donington qualifying performance was abysmal. We went the wrong way on setup and now we’ve changed tack. “Racing front-wheel drive is different to a rear-wheel drive car. You’ve got to make sure you get that front end into the corner because if the guy behind gets his nose up the inside he’ll drive straight by. Jelley’s visit to Thruxton in testing was his first around the Hampshire circuit in front-wheel drive machinery. Both Team Parker with Maximum Motorsport men along with a host of other drivers up and down the pit-lane have spoken about the value of lapping prior to racing here, given just how unique a prospect the track offers up. “It was the first time I’d driven the car at Thruxton and the first time I’d driven a front-wheel drive car at Thruxton, so it’s a little bit different and I was just taking it steady to start off with. We’ve got two cars to compare the data and it was just about not doing anything too silly to begin with. On the challenge of the ‘old school’ circuit Jelley sees things as a high speed balancing act. “Thruxton’s very unique. It’s different to any other circuit in the UK. Just in terms of the speed you’re travelling at and its bumpiness – you’re very aware that you’re travelling quickly. “The car bounces so you get the occasional hop and the rear moves around so you’ve got a lot of steering input. The balance of the car and the major moments happen quite slowly. “It moves around but then the rear might come around quite slowly but you’re still very aware of the speed you’re travelling it. It’s like balancing on a tightrope.